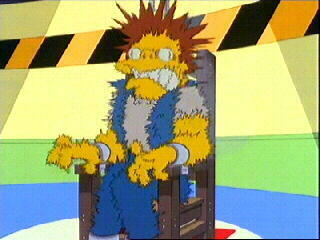 On this date in 1912, a prolific Springfield thief died in the electric chair. This fellow was Bertram G. Spencer, whose Boston Brahmin name belied a deceptively modest station. A brakeman by day, Spencer lived a double life as Massacusetts’ boldest burglar in the evenings, when he would raid homes around Springfield at times when he was likely to be caught. (Hey, he did have a day job.) He frequently was intercepted, but for two years nobody ever got the drop on him and the numerous conversations he had with his victims were not enough to crack the case. This villain comes up short of positively Moriartyesque by virtue of his amateurish chops in acquisition; one of the mystery burglar’s noted characteristics was the frequency with which he passed over the most valuable booty in the house in favor of some inconsequential bauble. With his penchant for brandishing a weapon at the folks he bumped into, it was only a matter of time before somebody died for one of those inconsequential baubles. On March 31, 1910, schoolteacher Martha A. Blackstone became that somebody when in a panicking reaction to Spencer’s home invasion she failed to pipe down and let him rob — and he shot her dead. Forensics then languishing in a primitive state, Spencer kept getting away with his larcenous (and then murderous) spree with little more than the expedient of wearing a kerchief and hat to hide his face. How were they ever going to find the guy — unless he did something ridiculous like drop a monogrammed locket on the scene? Wait. No way. You cannot be serious. 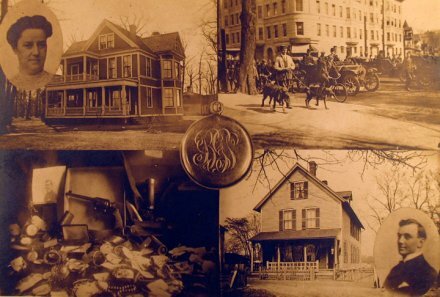 Period postcard shows images connected to the Spencer crimes centered around the “B.G.S.” locket he dropped at one site, leading to his detection. Just to really make sure he hung himself, the locket contained pictures of his mother and sister. Upon arrest, police tossed his home and discovered (quoth the New York Times) “black masks, slouch hats,” and “a big revolver, fully loaded” under his pillow. No word on whether he was twirling his mustache, too. Where the relieved well-to-do of Springfield perhaps saw only a somewhat preposterous villain — inspired, according to the Springfield Republican, by “a daredevil bravado, a love of the spectacular and a lack of pecuniary calculation which strongly suggested either the monomania of an unbalanced mind or a romantic vanity fed on by penny dreadfuls” — other practitioners in the emerging field of psychiatry saw a systemic breakdown. If the public was certain enough about Bertram Spencer’s sanity to elect a guy just to try him, it will come as no surprise that the testimony about Spencer’s abusive childhood and manic-depression cut no ice with a jury of his peers. 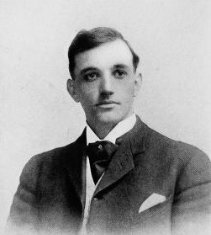 While our burglar went to his juridical death (last words: “good night”), a Massachusetts psychologist named Lloyd Vernon Briggs took up the man (alongside more luminous criminals like presidential assassin Leon Czolgosz) as one of his case studies for a 1914 book, The Manner of Man That Kills. A lengthy pdf of the Spencer material — it’s all public domain — is available here. Briggs viewed mentally disordered prisoners as people who were ill-served by the criminal justice system: more than that, as instances where a society failed itself by failing to recognize potentially criminal mental illness before it metastasized into actual crime, and the adversarial judiciary as a factor in that dysfunction. Briggs was an indefatigable advocate of the psychological links between mental illness and murder. He believed that mental illness and moral degradation were the root causes of crime and violence. … Briggs insisted that the “real offender is society and not the children in the form of men, not the mentally diseased” who commit violent crime. When mentally ill people landed in court, Briggs believed that the law’s adversary procedures undermined scientific truth and the legal protection provided a defendant. He wanted to bridge the gulf between law and psychiatry by intervening in the process before a mentally ill defendant appeared in court. He was especially critical of the “spectacle in our courts of two or more physicians pitted against one another, testifying to diametrically opposite opinions as to the mental condition and responsibility” of the defendant. Such a procedure, he said, not only humiliates the mentally ill defendant but increases the likelihood that a mentally ill capital defendant will be sentenced to death and executed … Briggs lobbied the public and the legislature for a law that required all capital defendants to undergo a psychiatric examination by neutral experts as son as they were taken into police custody.